23rd Ave is a Festering Gash Through the Central District: Put That Road on a Diet ! Looks like a pleasant place for a promenade, no? What fun to push a stroller around that streetlight pole as oncoming traffic rushes past an arms-reach away. Oh, how exhilarating to feel the wind in your face as a bus roars by so close you could reach out and touch it. Or for an exciting variation, try walking with your back to the traffic, and see if you can keep yourself from flinching each time a car screams up from behind you. This is 23rd Ave in the Central District, between Spring and Marion, about the suckiest pedestrian street you could imagine. The root problem is simple: the 23rd Ave right of way (ROW) is too narrow, and it should never have been made into a four lane arterial. The ROW on this section of 23rd Ave is only 60 feet, which, with four 12-foot travel lanes, leaves only six feet for sidewalk on each side. There’s no room for a planting strip, and if a tree is put in, it ends up blocking half the sidewalk. For comparison, even the side streets such as Marion have a wider ROW at 65 feet, with eight feet of planting strip between the sidewalk and the curb. Martin Luther King Way is 85 feet wide, and has only two travel lanes. Bikes lanes on 23rd are justifiable purely from the perspective of sustainable and balanced transportation. But a road diet would also be great medicine for the community around 23rd Ave by vastly improving the pedestrian realm and thereby catalyzing neighborhood revitalization. The power of streetscape improvements to spawn revitalization should not be underestimated, and a great example is just 11 blocks west of 23rd on 12th Ave between Madison and Cherry. Dropping 23rd Ave to two travel lanes will reduce its maximum car capacity. But there are many other two-lane arterials in Seattle that handle the same traffic load as 23rd, Broadway being one example (see traffic counts here). Still, I am highly skeptical that the City will follow through with the recommendation for bike lanes on 23rd, even though this recommendation was published by the City’s own department of transportation. And even though the City is trying to become more balanced in its transportation priorities. And even though we live in one of the most progressive cities in the country, the truth is most Seattlites are still inclined to give car capacity highest priority. I have been in touch with the City regarding how and when the final decision will be made on bike lanes on 23rd Ave bike lanes, and will post when new info becomes available. Posted by dan bertolet on	Sunday, February 24th, 2008 at 10:48 am. You can follow any responses to this entry through the RSS 2.0 feed. You can leave a response, or trackback from your own site. Hmm. Really? Are the volumes really low enough that they could reducing it to two lanes plus a turn lane and two bike lanes? Just from observation I would think that volumes north of Madison are lower than volumes south of Madison. I think that sometime it makes more sense to separate bikes from major arterials by make “bike boulevards” a street over. I know that portland has done this with success. Even if you give bikers a dedicated lane it is much more pleasant to ride on a neighborhood street rather than a major road. A pet project of mine is that the 48 should be upgraded to BRT, and as much exclusive ROW should be set aside for that. I know that there are no plans for that to ever happen but I think that in Seattle we have very few arterials that allow transit to move quickly throughout the city so we just need to be careful what we do with them. I would love to subscribe to your blog, but both the RSS feed and ATOM feed have errors according to IE7. Have you heard about this problem before? I believe at some point I was tasked with writing this article, but luckily enough Dan beat me to the punch, and is obviously more eloquent than I ever could be. This looks exactly like 39th avenue in Portland – 35 mph speed limits, 4 lanes of traffic, measly little sidewalks with no buffer between them and the road. Adam, SDOT’s maps show 20,900 per day on 23rd north of Madison, and 15,100 south of Madison. Broadway (and 10th E) has 15,500 and MLK has 14,700. Agreed about bike blvds being more pleasant. But if you want to go fast an arterial with a bike lane is better. And many people ride bikes to get places rather than just for recreation. I’ll take BRT on 23rd if it means the outer lanes are only used by buses. That would at least give some relief to peds on the sidewalk most of the time. Whats the benefit of making the 48 BRT? 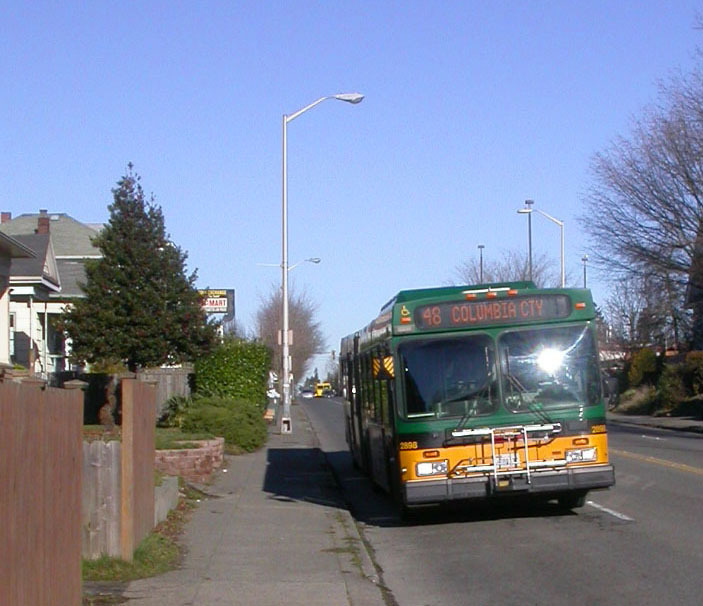 I could see the benefit of an express route with limited stops to make travel to/from the U-District faster, but in my experience on the 48 the problem is not central district to the U-District, but the U-District to/from greenwood which is painfully slow. Personally I would much rather see bike lanes. I’m not sure converting 23rd to two-lanes/turn lane/bike lanes makes a lot of sense, particularly since 19th already has bike sharrows. On the other hand, reducing the transit lanes and adding a center turn lane does make some sense, since there seems to be an on-going issue with cars needing to make left turns primarily from the north-bound lanes, which can cause some significant backups along 23rd, north of Madison. IF the bike lanes could be incorporated into that kind of a structural modification, I could see some benefit, although I have to say, as a daily commuter along 23rd, I seldom see more than a handful of bikes along that corridor between E Union and Boyer, so I’m not sure if this would be more a matter of “if you build it, they will come”, because there doesn’t appear to be, from my observations at least, a pressing need for this currently. Just getting to the Red Apple from my house is a bit harrowing. Walking or bicycling, you’re a 2nd class citizen on 23rd. It really is a blighted corridor. 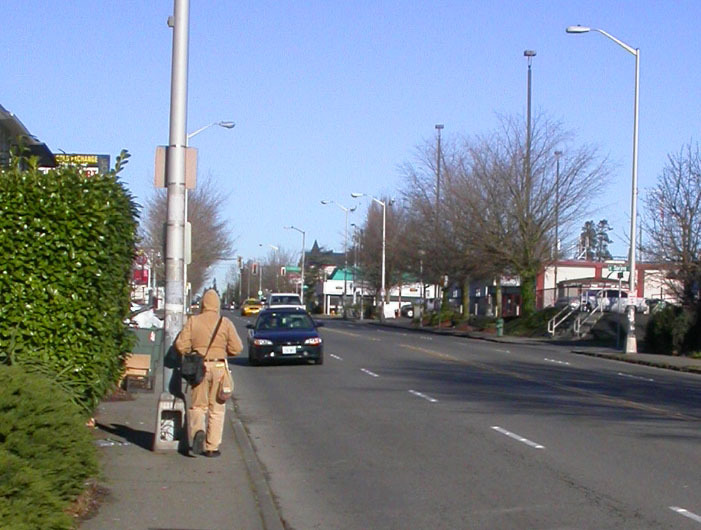 FWIW, the destinations are on arterials – as are the signals that give priority over non-arterial streets. While I commute 19th daily, it’s annoying to have to stop and wait at every arterial crossing (only Madison has a light). Real bike boulevards have half-signals at the arterial crossings. With those my commute might be a bit more efficient, but that still doesn’t reconcile the fact that 19th does not bring one to daily destinations. So, with the capacitiy of a 3 lane urban cross section being 22,000 vpd – and the current volumes being less than that – it would make a prime candidate for rechannelization. The sooner the better in my mind. 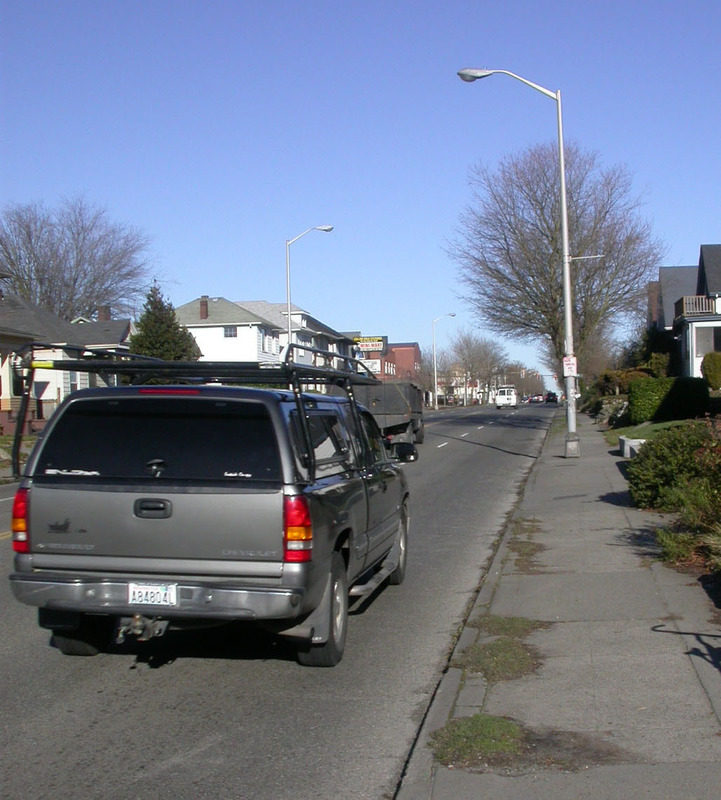 Often bike boulevards provide parallel routes to busy arterials where either there is not sufficient roadway to accommodate bicycle lanes, or the conditions deem it unsafe for bicycles, e.g. streetcar tracks. That said, if 19th is in fact a bicycle boulevard, it should have some kind of special signal treatments where it intersects arterials, espcecially at the Union St intersection. Of course the best scenario for that corridor is a rechannelized 23rd ave with bike lanes.